More than anything else, the one thing that absolutely astonished me upon my arrival here in February was the rapid settlement growth that has taken place over the last 15 months. The changes are blatantly obvious. Existing settlements have expanded and numerous new ones are sprouting up on the hillsides. It is an undeniable reality. Ariel Sharon’s famous words “Grab every hilltop; what we take will remain ours” are becoming truer by the moment. (found at http://www.palestine-primer.com/Palestine_Primer/Maps_%26_the_Land.html) If the Israeli’s are intent on creating “facts on the ground,” they are succeeding. As the current political stalemate continues, settlement building continues – putting up more and more Israeli housing units and supporting structures (shopping areas, roads, water and electrical infrastructure) as well as businesses and factories, on Palestinian land. What do expanding settlements mean for Palestinian people? Obviously, there is a loss of land. In the West Bank, settlement growth continues to overtake the countryside, separating Palestinian villages from their neighbours and gobbling up prime agricultural land. The contiguity of the West Bank is severely jeopardized, and people often speak of the West Bank as being divided up like a piece of Swiss cheese. Here in East Jerusalem, in the neighbourhood of Sheikh Jarrah, there are ongoing court battles over homes the Israeli’s want to take over. Just last week, we visited with a man who had half of his house taken over by settlers in 2009. Now, an American settler who has been in the country for 12 years, lives in the front portion of this man’s house while the man and his family live in the back portion of the building. 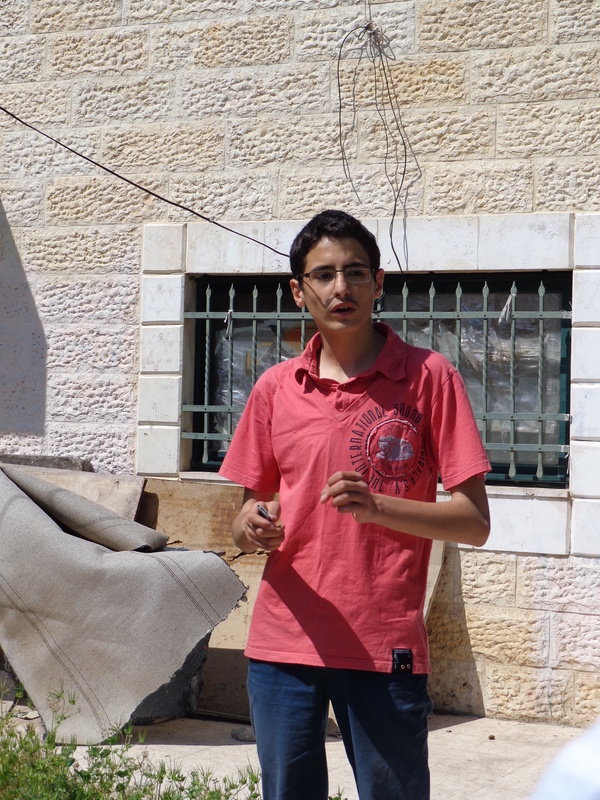 Mohammed al Kurd, standing outside his family’s home in the East Jerusalem neighbourhood of Sheikh Jarrah. Israeli settlers took over the front part of their house, leaving the family to live in the back. On Thursday, we stood on a hillside outside of Bethlehem, looking out over what had been Palestinian land. Across the hilltops was one settlement after another. 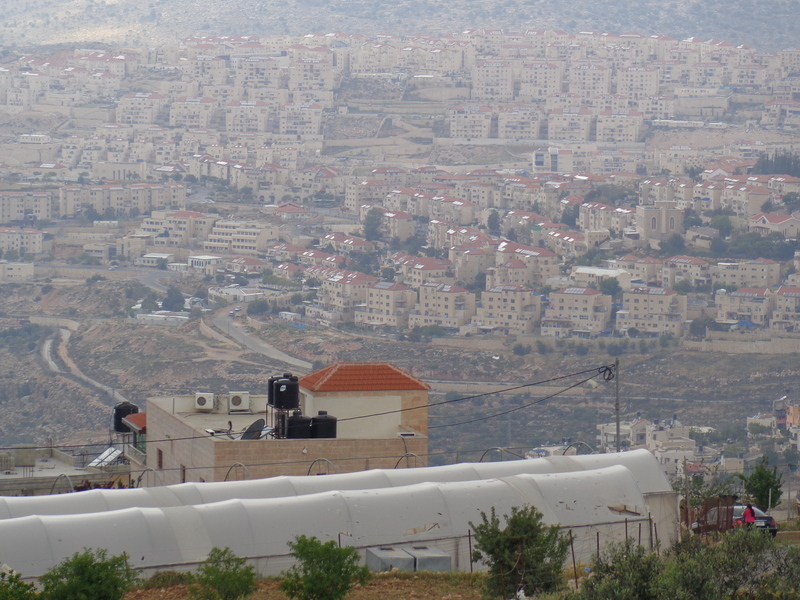 Vast settlement expansion outside of Bethlehem. On Saturday, we visited the community of Al Khalayleh, located a few kilometres north-west of Jerusalem. The community is surrounded on 4 sides by Israeli settlements. 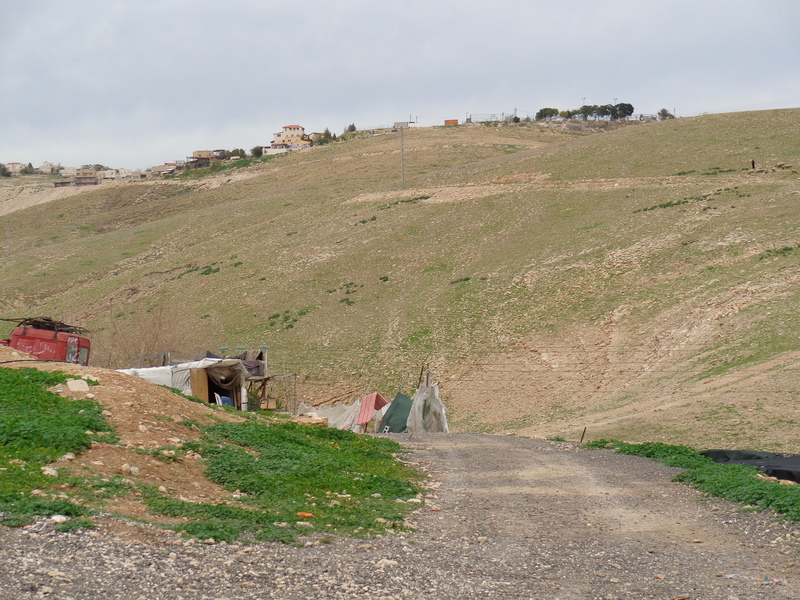 As we stood on the hillside, among the ruins of a Bedouin village that was demolished just before Christmas and the people moved to the Jordan Valley, we looked over at the nearby settlement encroaching further and further onto Palestinian land. It was like looking at several layers of a multi-layered cake, as each row of housing progressed further down the hill. Settlement expansion moving down the hillside, near Al Khalayleh, outside Jerusalem. That afternoon, we visited the Bedouin village of Khan al Ahmar, located a few miles outside of Jerusalem. 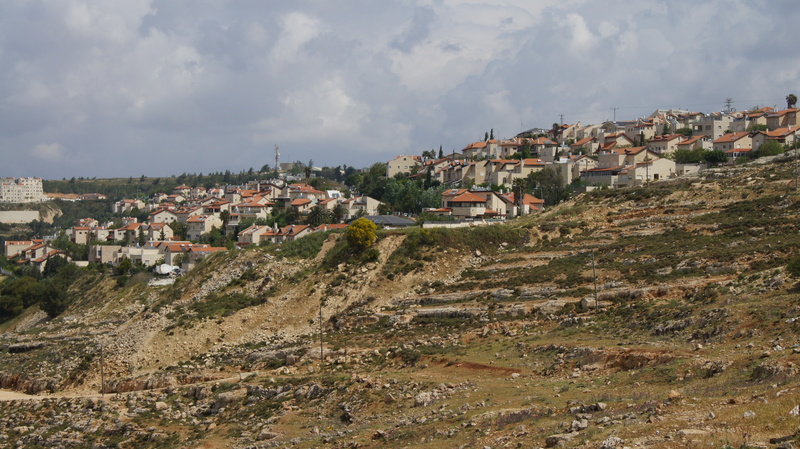 The building of the nearby neighbouring settlement, K’Far Adummim, located only a short distance away from the village on the nearby hilltop, began in the 1980’s. Progressively, they have taken more and more land from the Bedouin, making it impossible for the Bedouin to graze their goat and sheep herds. In the 1990’s, the villagers had approximately 1600 head of goats and sheep, with 25 camels. Today, with little access to grazing land and livestock feed prices at 2000 NIS/ton, villagers can only feed about 140 head of sheep and goats and no camels. Furthermore, with the building of their school in 2009, the neighbouring settlers then blacklisted anyone from the 5 villages the school serves from employment on the settlements. Now, the Bedouin face imminent displacement against their will, in a move that will free up their land for further settlement expansion. K’far Adummim settlement, located on a hilltop and encroaching upon the grazing land of Bedouin village Khan al Ahmar. These are a few of the very real effects of Israeli settlement development and growth in the occupied Palestinian territory. What is happening is that Palestinian people are losing more and more land to these settlements. It is being taken from them, and they have no say in the matter. As the land goes, so too goes much of their livelihood, given that the land being taken in the rural areas is agricultural land. In Jerusalem, people are literally pushed out of their homes, while Israeli’s move in. Settlements are in direct contravention of International Law, which could not be clearer. “The Occupying Power shall not deport or transfer parts of its own civilian population into the territory it occupies.” (Article 49, Geneva Convention IV) “This has been confirmed by the International Court of Justice, the High Contracting Parties to the Fourth Geneva Convention and the United Nations Security Council.” ( UN OCHA Factsheet “The Humanitarian Impact of Israeli Settlement Policies Update December 2012”, found at www.ochaopt.org/documents/ocha_opt_settlements_FactSheet_December_2012_english.pdf) All world bodies have spoken. The United Nations Security Council Resolution 446, of 22 March 1979 was strongly worded: “… the policy and practices of Israel in establishing settlements in the Palestinian and other Arab territories occupied since 1967 have no legal validity and constitute a serious obstruction to achieving a comprehensive, just and lasting peace in the Middle East.”… “Land seizure for settlements is illegal.” (www.diakonia.se/ihl). But still it goes on. As the world stands idly by, Israel continues to illegally move its citizens into the occupied Palestinian territories. And not only that, the residents of settlements are given far greater privileges and services than Palestinians are allowed, and all too often are violent towards the Palestinians. (see previous blog postings) It is a profound injustice. This past week, Israeli human rights group Yesh Din published a new report “The Road to Dispossession: A Case Study- The Outpost of Adei-Ad” found at http://www.yesh-din.org/postview.asp?postid=254. Outposts are the initial buildings of a future settlement. In the report, they identify how “the observation of a single outpost helps understand the general phenomenon and the method of the outposts as a means to take over Palestinian land.” This is a highly recommended report that will help the reader understand the Israeli settlement enterprise and their effects on the Palestinian and Israeli populations. The United Church of Canada’s General Council 41 met last August and passed a resolution regarding the Israel-Palestine situation. Part of the resolution dealt with economic action against settlement products, given that these settlements are illegal. This is a request consistent with action taken by other nations, including Austria, Belgium, Finland, Ireland and several others. Option A calls for the Palestine/Israel Education and Economic Action Campaign to be activated beginning spring 2013. Option B proposes that the launch of the campaign be deferred until further direction from the Executive to allow more time for “study, prayerful discernment and personal action by the members of the church”. Of these two options, Option A is by far the best option to address the above mentioned portion of the resolution. It is imperative that we act now. It is essential that we act with substance. To wait is to stand by watching, while more and more settlement expansion and growth continues. I cannot emphasize enough how quickly settlement construction is occurring. Our Jerusalem team met last week with Rabbi Arik Ascherman of Rabbis for Human Rights. In his comments to us, Rabbi Ascherman quoted Rabbi Abraham Joshua Heschel, one of the leading Jewish theologians and Jewish philosophers of the 20th century, who said “in a democracy, some are guilty but all are responsible.” His words ring true. While the actions of others may not be our actions, in a democracy we all share the responsibility for what is happening. As such, and following the ways, the words and the actions of Jesus, we are called to do our part to work towards justice. http://www.unjppi.org/newsletters.html and click on “Write to Conference GCE reps.” The time for discussion and debate is long since passed. General Council 41 were clear in their decision and their call for action. Now is the time to act!! Empower a People and Watch Change Happen!